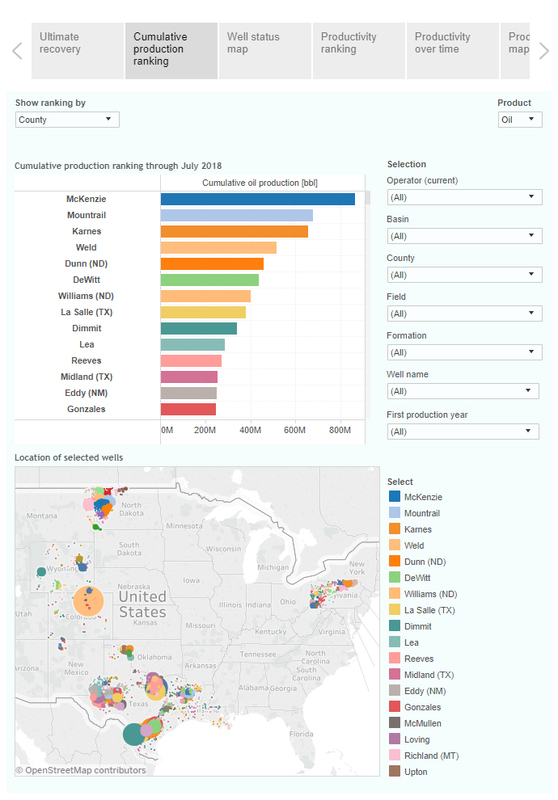 This interactive presentation contains the latest oil & gas production data from 95,093 horizontal wells in 10 US states, through July. Cumulative oil and gas production from these wells reached 9.3 Gbo and 102.9 Tcf. Ohio and West Virginia are deselected in most dashboards, as they have a greater reporting lag. Oil and gas production from horizontal wells kept setting new records through the first 7 months of this year. The 5,600 new producers contributed ~2.2 million bo/d and 10.4 Bcf/d in July, versus 4,600 new producers in the same period last year (which contributed 1.6 million bo/d and 9.1 Bcf/d in July last year). 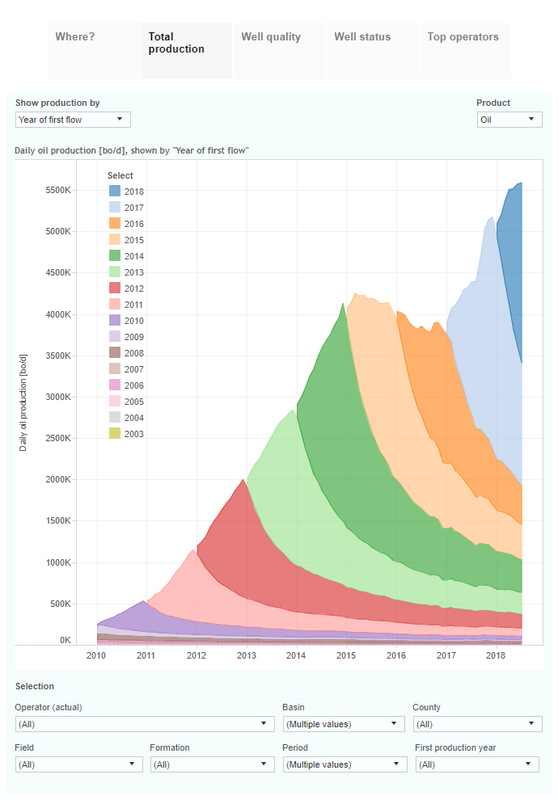 The steady increases in well productivity between 2012 and 2017 are clearly visible in the 2nd tab, ‘Well quality’, where the oily basins have been preselected. Almost 12 thousand wells were completed in these plays in 2014, more than in any other year, which is why this curve is drawn with the greatest thickness. The final tab shows the production and location of the wells operated by the largest operators, as measured by their cumulative production in the past decade. 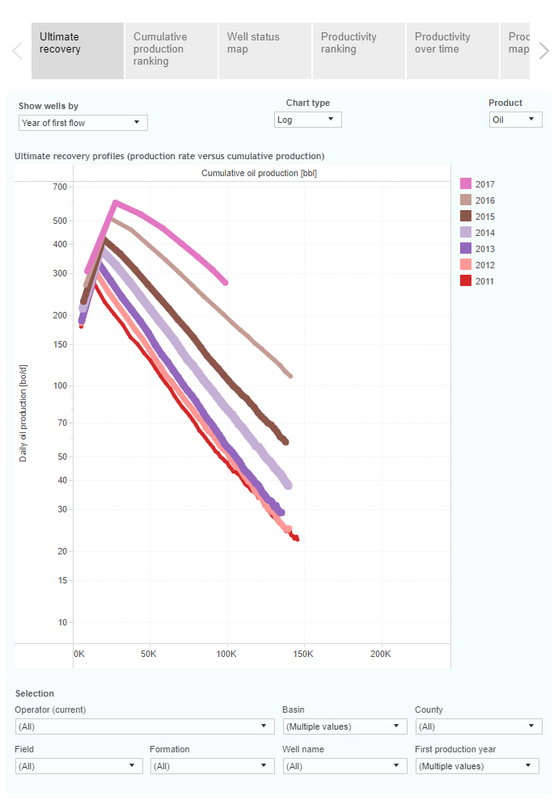 This “Ultimate recovery” overview shows the relationship between production rates and cumulative production over time. The oil basins are preselected, and wells are grouped by the year in which production started. 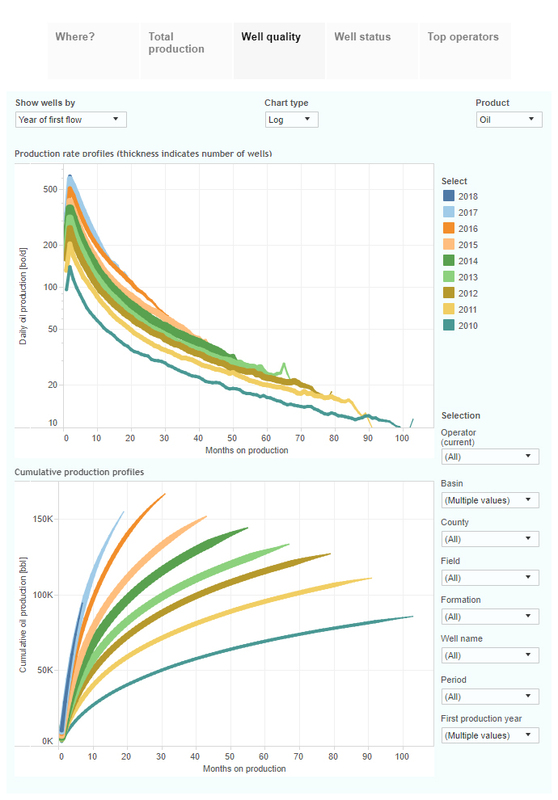 You can see in the graph above that the 7,600 wells that started in 2017 recovered on average almost 100 thousand barrels of oil in the first 8 months on production, while declining from 600 bo/d to 274 bo/d. More recent and granular data can be seen by grouping the wells by the quarter or month in which production started. The 2nd tab, ‘Cumulative production ranking’, ranks all counties with horizontal production based on cumulative oil production. McKenzie and Mountrail counties, both in North Dakota, are in the lead, but Karnes (Eagle Ford) and Weld (Niobrara) are catching up on the number 2. Early next week I will have a new post on North Dakota, which will soon release September production data. In our ShaleProfile Analytics service we keep all data up-to-date on a daily basis, and for most states we already have August or even September production in. If you’re interested, you can request a demo or trial here.